Great Pumpkin is an improbable face and flake climb up the right side of Fairview Dome. Seriously runout for both the leader and follower, it is not to be taken lightly. 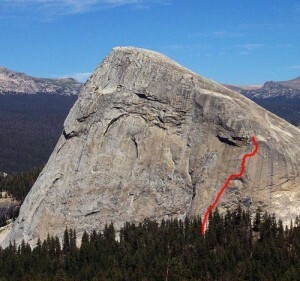 However, for those comfortable on very runout 5.8 face in Tuolumne, it is an outstanding romp up perfect granite. The remaining 1/4” bolts were replaced by the ASCA in 2002. Which SuperTopo guidebooks include a topo for Great Pumpkin? Fairview Dome is Tuolumne's largest steep face.